My vehicle has an old fashioned cassette and cd changer which I barely use. I wanted something to stream music and podcasts with my phone without the expense of a new head unit - plus I like the standard look. This does the job. It’s not perfect and there’s some mild interference. Also the volume isn’t great but that might be improved with playing around with frequencies. The battery voltage is a nice touch and pretty useful too. For the price its a good option. Cheap, ok but not great! It's reasonably compact. The instructions don't come with the product, I had to trawl through the posting on eBay. The sound quality isn't great in that there is high pitched interference. Also, it disconnects from blue tooth after what seems like a relatively short time of innactivity so you have to reconnect it more or less every time you get back into the car. On the plus side, it was inexpensive and is a step up from plugging a tape into my phone which I was doing in my old car before I bought it! 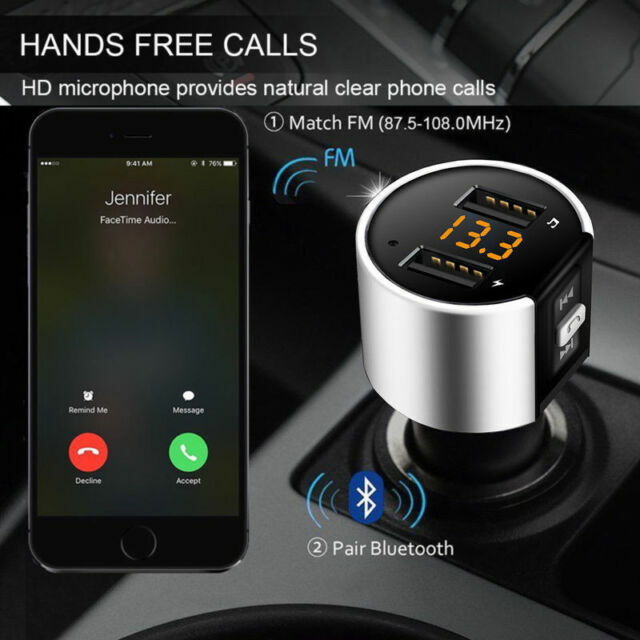 This is great wish I had got one sooner makes streaming on Bluetooth from my phone to my car super easy and the higher charge ports are so handy. Very easy to set up just switch on Bluetooth and select C26S then set the radio and receiver to an unused radio channel I used 87.7 and start streaming. Only thing I would say is remove it when not in use as it drained my battery but once recharged was fine and as long as u take it out when not running the car it works great. So much more space now I havnt got millions of cds crammed in the glove compartment.